HFC units provide direct heat to hot water systems. Hot water comes almost as a by-product from HFC technology. The HFC unit is a small gas burning module that converts gas into electricity for the home. As a result of this process a lot of heat is generated, which can then be diverted directly to a storage tank for easy water heating. It can also be integrated with solar hot water systems to form the booster component. HFC hot water systems typically come in the storage tank variety. As they are an emerging technology they may later be adapted to support continuous flow varieties. Where are HFC hot water systems most commonly found? As HFC technology is very new to the Australian market, this type of system is very rare. As time passes and HFC prices come down to the point where they are viable domestic alternatives to using grid power, we can expect these systems to become more popular. Is a HFC system for me? As producing hot water is not the main focus of the HFC, this question will only come up if you are seeking to have one installed for your home. If you are, or you already have one, then configuring a hot water storage tank to fit in with your design will save you money in the long term since you will be using the HFC to generate power anyway. As HFC units are currently hugely expensive, they are not a viable choice for most people. A HFC unit is the first requirement. You will then need to have this connected to a separate water storage tank to make use of the heat generated by the device. 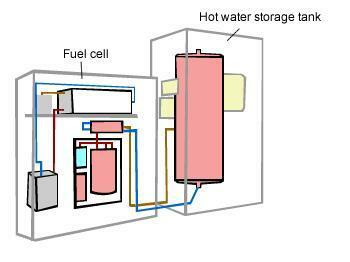 A home fuel cell system not only provides for the entire household's hot water needs, but can also feed electricity back into the grid.